The Drake Hotel is one of Toronto's newest art and design hotspots. We created two permanent installations for Toronto's popular Drake Hotel, a re-invented flophouse that has become an edgy destination spot celebrating the bohemian spirit in the tradition of hotel salons. Our pieces are subtle and integrated into the structure of the building, allowing it to react to its occupants. 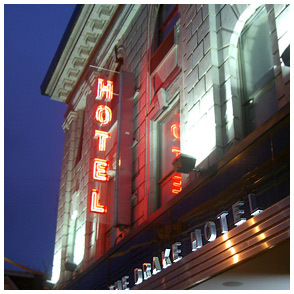 Threshold Memory turns a doorway into an ever-changing monument to the community that has shaped the Drake. Heartbeat brings to life the playful soul of the Drake by capturing the activity in each of the hotel's six public spaces.